Description: Four schemes at Motor Storage in New Haven. This scene has since changed. 824, was retired at Bear, Del in 2005 but later returned to service after an overhaul into Phase V. 522 & 524 were repainted into Phase V and reclassified as GP38H-3. 530 has since been repainted. SS 75, (the brick building) has since been torn down. Description: The power plant across the track is now razed. This equipment has all been repainted. Description: Amtrak 524 lets out some smoke after being started up. 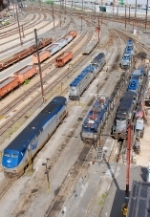 Description: A collection of Amtrak locomotives in the yard at Amtrak's 30th Street Station. Description: Amtrak 524 in Philly. Description: Amtrak Yard at Philly. Description: Amtrak 524 leads a northbound MW train with Herzog ballast cars, mid train caboose and flat cars loaded with reclaimed concrete ties at Gunpow interlocking. Description: Train 20(6) with reman AEM7 905 passes the TLM machine at Middle River, MD. Description: Amtrak 524 with the TLM machine, re-claimed ties forward, new ties against TLM. Train working on number 1 track, MP 85.3, PW line.